There are several types of access control systems on the market with specific advantages and disadvantages. Systems used with proximity access card are the most popular. However these cards can be left at home or stolen. The biometric access control system provides higher reliability and security by using individual personal tickets and comparing it with data stored in the system. The biometric data is unique and individual for everyone, so systems with bio-control can provide more reliable authentication than code-based or card-based systems. The technology of biometric authentication has rapidly developed in recent years. With the latest high-end products the access process could take less than a second. Our fingerprint reader technology is already used worldwide with pleasure, especially in Western Europe, Far East and US. The fingerprint is detailed, unique and difficult to copy. It does not change over the years, providing a long-term solution for individual identification. The system we offer includes fast and reliable reader units and as well the operating software which is modular expandable. We offer a full range of T&A and Access control functions for the whole company with all size. We do not store biometric data! Our systems scan reference points of fingerprints, than it generates a code with the help of a secret algorithm. This is a one-way process, so the biometric data can not be re-produced again. The most popular and widely used biometric identification method is fingerprint recognition thanks to the appearance of high quality optical sensors. Fingerprints are unique and remain permanent throughout a person’s life. Every person has unique fingerprint, which has a constant pattern after birth. Changes can be occurred only by an injury. 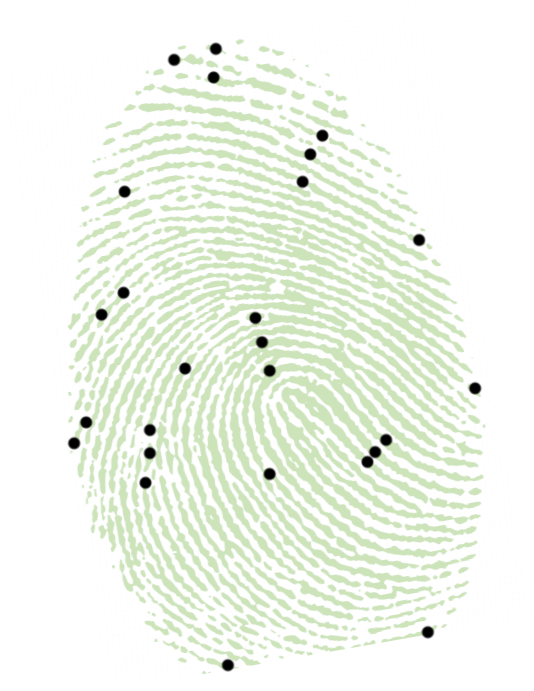 Minutiae points are the major features of a fingerprint image and are used in the matching of fingerprints. When a set of finger images is obtained from an individual, the number of minutiae is recorded for the selected fingers. The precise locations of the minutiae are also recorded, in the form of numerical coordinates, for the selected fingers.